Jet City Gastrophysics had our fourth meeting in June of this year. Eric was busy working at Canlis and Blueacre, so it was up to Scott and myself to boldly forge ahead. Back in May, I was scanning eBay and came across an honest-to-goodness chamber vacuum sealer with 1500 bags included. The price was steep, but it was still 40% cheaper than getting the thing new with the bags as well. There are many other things that I can put that money to work on, I thought to myself. Whatever. I grabbed it. And so we set about playing with it. Just sealing the watermelon alone, its clear how the color becomes much more intense. Taking a cue from Cat Cora on Iron Chef, we took slices of watermelon and sealed them with V8 juice. Incredible. The watermelon loses its flavor as the V8 takes over, yet retains its texture. Your mouth doesn’t quite know what’s going on. It would make a perfect garnish for a Bloody Mary. The takeaway is that the watermelon’s structure survives but the flavor can be replaced with something else. We were thinking of other foods with similar structures. I know of some fruit I’ve had in Taiwan but I can’t recall the name. 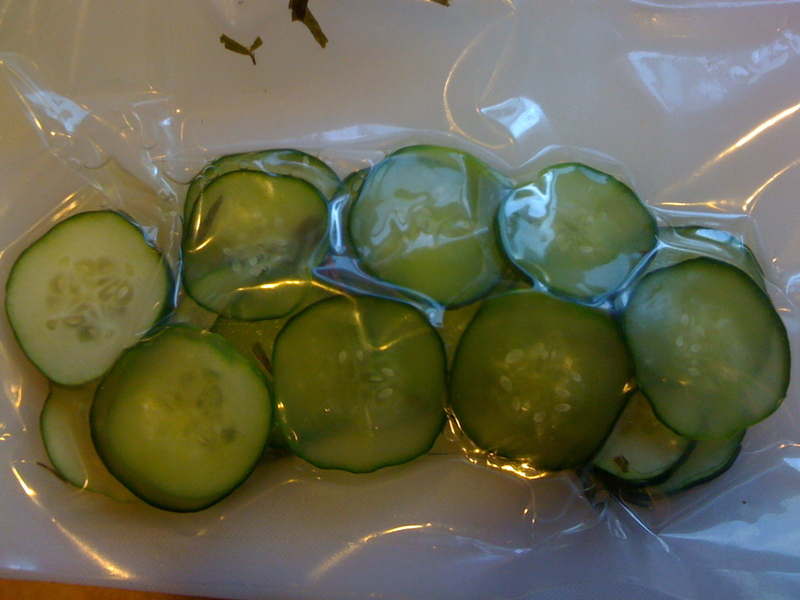 Next up we tried flash pickling cucumber slices by vacuuming. It definitely worked, but as neither of us had pickled anything before, we improvised the ingredients – white vinegar, sugar, salt, rosemary – with mixed results. With a little practice we’ll nail it. The anti-griddle is the brainchild of Chef Grant Achatz at Alinea in Chicago. The whole concept is instead of heating/frying something on a griddle, you freeze it instead. Buying one of these new can set you back $1200, which seems a little pricey for a home appliance that won’t be used everyday. And besides, I had just started making payments on my vacuum sealer. What? I’ll use THAT everyday. C’mon. We set the towel down, put the dry ice block on top of it, and the cookie sheet on top of that. Within minutes we had an extremely cold surface to ‘cook’ on. We tried flash freezing chocolate sauce, honey, olive oil, balsamic vinegar, raspberry jelly, watermelon and strawberries. 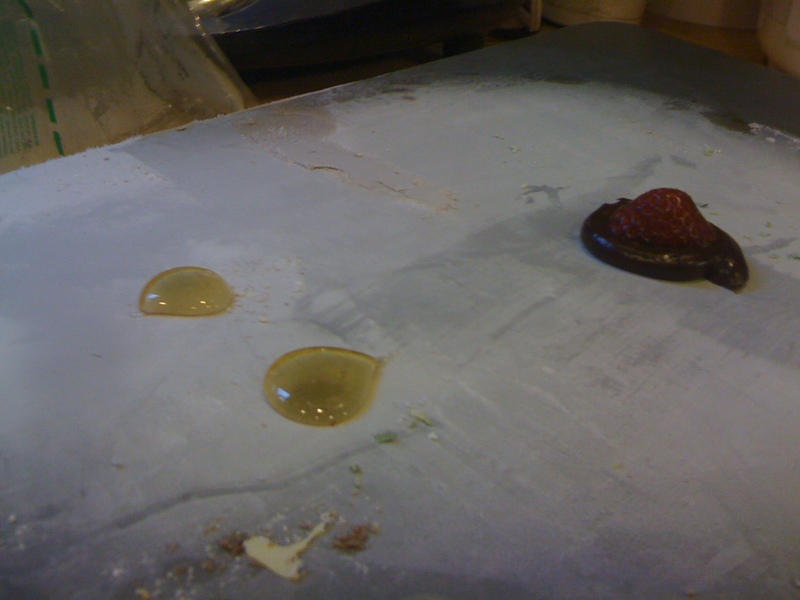 The honey with a short freezing time was great – the consistency was taffy-like. The other one that worked best was a small coin of Dilettante chocolate sauce with a strawberry on top with lime zest. A lovely little treat. What needs further study is to nail down what products work best and what time is required to let them freeze to the right consistency. Otherwise they get over-frozen, the anti-griddle’s analog to burning. Freezing liquids seem to taste better than solids (the watermelon and strawberries were ‘meh’). 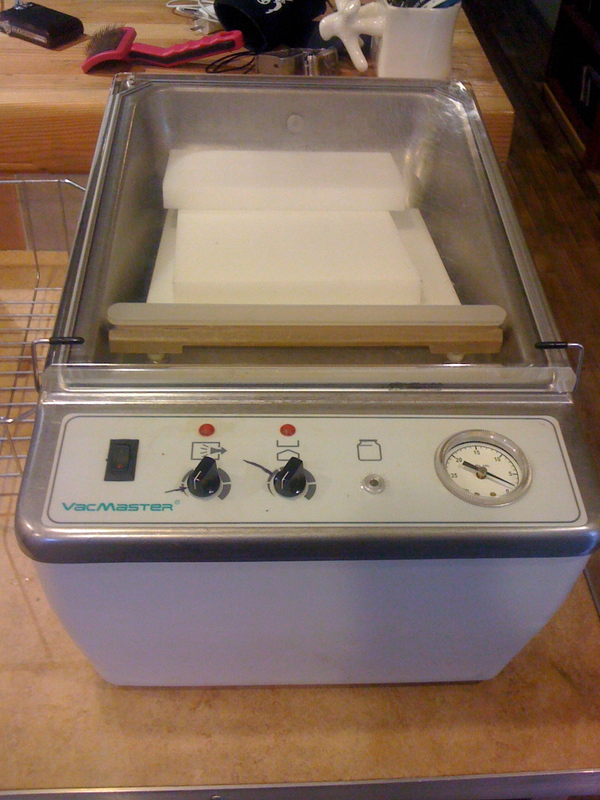 Another issue is that because the DIY anti-griddle is a block of dry ice, you can’t control the temperature. It’s kind of like having a griddle that’s only set to ‘High’. So, given that restriction, what works best on its ‘setting’ is key. And if that requires eating more chocolate, strawberries and honey, well then, call me a research scientist. Holy sh+# I’m jealous you picked up one of those bad babies. I sooo want to add a proper sealer to the collection but haven’t yet been able to justify the cost and space (though I’m very happy you did- I will use this as ammunition against the angel on my shoulder). The watermelon proves very interesting indeed. I wonder if it might alter cooking times a bit if you’re able to achieve such a perfect seal. Have just discovered your blog- I’ll be back. The DIY antigriddle seems questionable because I bet you can attain a similar effect with other methods, however your investment wasn’t much so I get that it would be fun to play. Would love hear of further experimentation with it. Yes, you should be jealous. Tell that angel to BUZZ OFF. I mean really. I only know of one other method that gets it as cold: put a cookie sheet over a basin filled with liquid nitrogen. What method are you thinking of? And yes, dry ice is relatively cheap, and you can use it once you’re done flash freezing for instant ice cream. Do that with another griddle. i am also envious that you have a chamber vac. For the watermelon, next time try using lemon juice and tandori powder or even pimenton (picante). would love to host a cook off at home some time – have a few toys but no vac. Thanks for the tip – sounds delicious! Last night I went to Spur Gastropub and they had a dish combining watermelon with tuna sashimi. 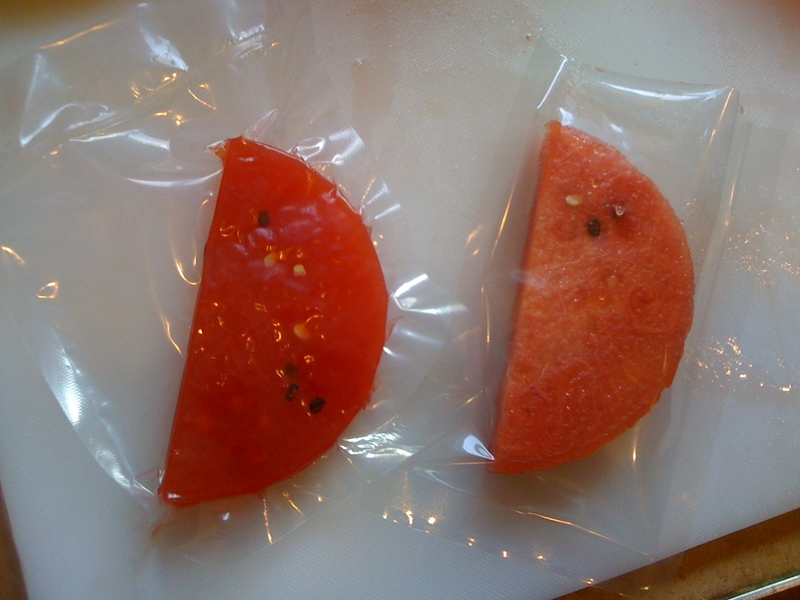 I’m going to see how that goes if you juice the tuna and infuse the watermelon. I have been pickling almost anything that does not move in my new vac chamber. Sliced strawberries in Rice wine, sugar, and togarishi nanami is amazing.